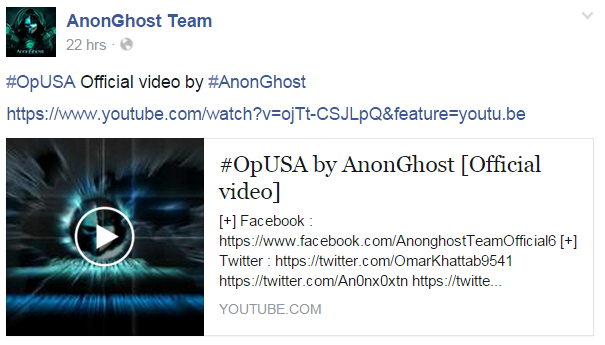 Hacking group AnonGhost has published an official video on #OpUSA, its upcoming cyber campaign against the United States. 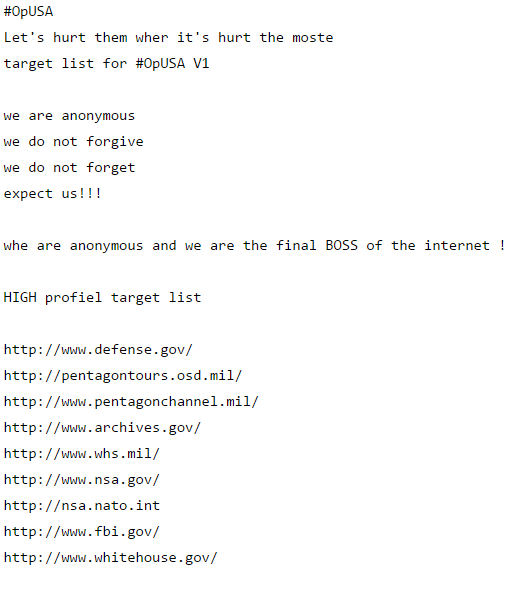 The video, addressed to the U.S. government, does not mention the date of the campaign or the list of targets, but based on the group’s 2013 #OpUSA campaign, it appears that it is set to take place on May 7. The official video’s YouTube page mentions prominent AnonGhost members Mauritania Attacker, An0nx0xtn, DarkCoder, Donnazmi, and Hussein Haxor, all of whom promote the group’s agenda in social networks. 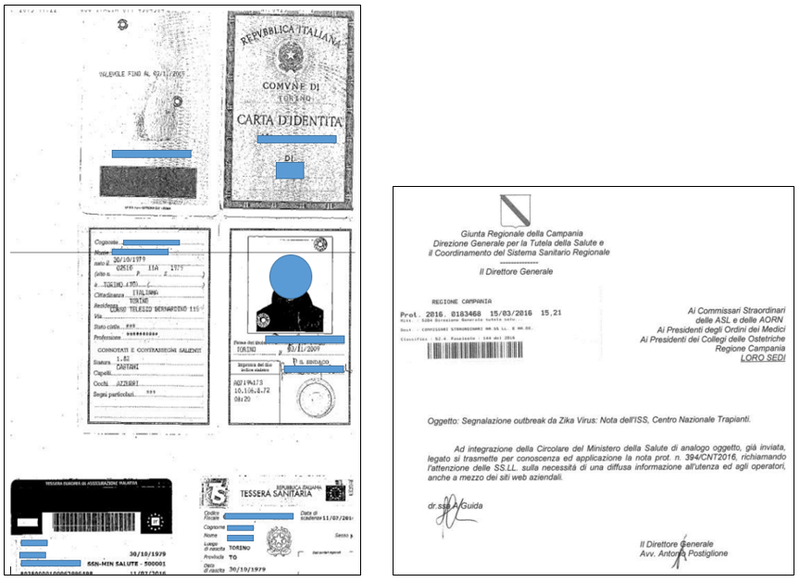 On May 7, 2013, AnonGhost, along with other groups such as the Tunisian Hackers, threatened to hack American government and financial websites. While they were highly motivated, they failed to achieve much other than to deface several websites and leak emails and personal information. A possible reason for their limited success is that several days before the campaign, hackers speculated on social media that #OpUSA was actually a trap set by the federal government in order to expose and arrest the participants. One of the groups that participated in 2013, N4m3le55 Cr3w, published a long list of recommended DDoS tools at that time, most of which are common hacking tools that are likely to be used in the current campaign as well. TorsHammer, a Python-based DDoS tool created by the group called An0nSec. SYN Flood DOS, a DDoS tool that operates with NMAP and conducts a SYN Flood attack. 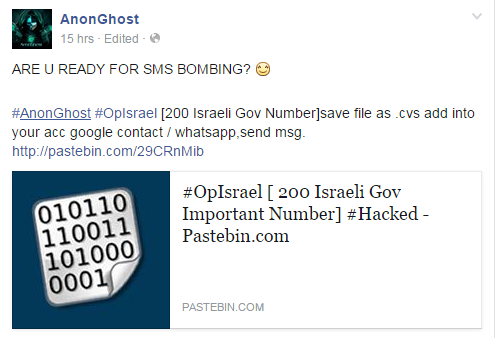 This is the third round of the anti-Israel cyber campaign called #OpIsrael. 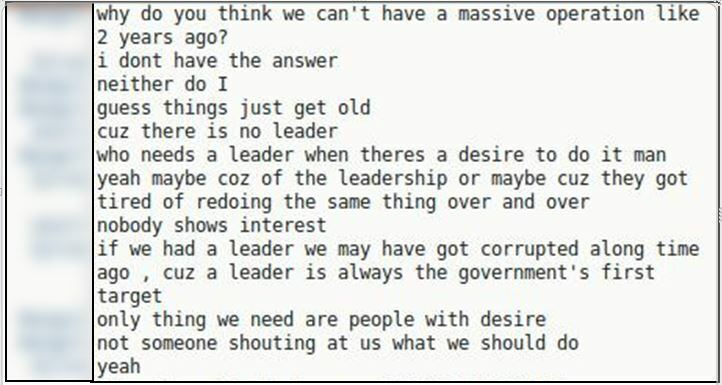 The hacktivists are highly motivated to attack Israel, and they have been gradually building their campaign infrastructures on social media networks. Many have been posting videos with threatening messages in the leadup to April 7. 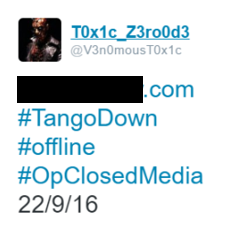 AnonGhost, which is behind the campaign, has announced that it will cooperate with three anti-Israel groups known from previous campaigns: Fallaga, MECA (Middle East Cyber Army), and Anon Official Arabe. Most of the social media discussions about the campaign are taking place in the Middle East, North Africa, Southeast Asia, Western Europe, and the United States (the attackers appear to be using proxy services). In addition, during March 2015 the number of Twitter tweets about the campaign increased by hundreds per day. Nevertheless, it is important to note that during the campaign, there will likely be several thousand or even tens of thousands of tweets a day, as was the case during previous campaigns. At the time of writing, the number of participants is about 5,000. The most prominent groups in the campaign are from North Africa, the Middle East, and Southeast Asia. Groups of hackers from South America, such as Anonymous Chile and Anon Defense Brasil, and hackers affiliated with Anonymous have also expressed support for the campaign. We have not yet seen evidence of active involvement or public support for the campaign by cyberterrorist groups. The attack targets recommended by those participating in the campaign are government websites, financial websites such as the Tel Aviv Stock Exchange’s or the Bank of Israel’s, academic websites, telecom websites, and media websites. These lists are familiar from previous anti-Israel campaigns. 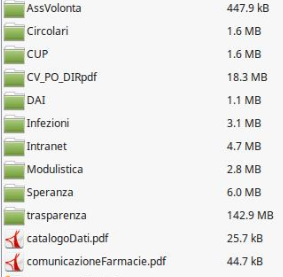 In addition, AnonGhost and Fallaga leaked a list of hundreds of telephone numbers of Israeli officials from an unknown source to point out potential targets for anti-Israel text messages or phishing attacks, such as those that took place during #OpSaveGaza. AnonGhost DDoS – A DDoS tool developed by AnonGhost, which initiated the campaign. LOIC Fallaga – A DDoS tool developed by Fallaga. This tool was developed for an anti-Israel hacktivist operation that took place on March 20 of this year, but we expect that hacktivists will use it in the #OpIsrael campaign as well.